Alec Guiness won a Best Actor Oscar for his portrayal of the dogmatic but brittle commanding officer in David Lean's film "The Bridge on the River Kwai". While a brilliant performance, it owed more to fiction than fact, as the man who actually commanded the POWs ordered to build the infamous bridges - there were in fact two: one wooden, one concrete - was cut from very different cloth. Lieutenant Colonel Philip Toosey, the senior officer among the 3000-odd Allied servicemen in Tamarkan prison camp had to comply with Japanese orders to help construct their Thailand-Burma railway. With malnutrition, disease and brutality their constant companions, it was a near impossible task for men who had already endured terrible privations but under Toosey's careful direction, a subtle balancing act between compliance and subversion, the Alliedinmates not only survived but regained some of their self-respect. 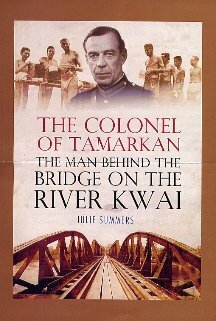 Re-creating the story of this remarkable leader with tremendous skill and narrative flair, and drawing on many original interviews with Second World War POWs from the Asian theatre, THE COLONEL OF TAMARKAN is a riveting blend of biography and history. JULIE SUMMERS is a writer and researcher and the granddaughter of Sir Philip Toosey. She is the author of several previous books including Fearless on Everest : the Quest for Sandy Irvine. Julie lives with her husband and three sons in Oxford.